Welcome to the Sound City Reading web site! ​If you are interested in phonics materials to teach beginning reading or to help older students become better readers, you have come to the right place. Scroll down to see the introductory information on this page or click on any of the menu items at the top of the page to visit the other pages on this site. If you have used any of the Sound City Reading materials with students, please consider filling in a survey to share your experience with others who visit this website. See Share Your Experience under the BLOG heading on the menu. Several months ago, I revised this web site by setting up a new theme that has a responsive web design. This means that the web site display will adjust to fit on various screen sizes, including smart phones, tablets, and computers. One of the main reasons I switched to this design is so that the site would have a wider display area, allowing me to fit two sound charts side by side on a page. This way the charts can appear in the same way as they appear in the books. I've received both positive and negative feedback on this design from teachers and parents who are accessing this site. Some people say that they can navigate the site without any problems, and others say that they find navigating the site extremely frustrating. If you are having trouble, please see the instructions printed in green below to help you find and use the menu. My best advice is to try navigating the site from a computer, so that you will be working from a larger screen. If the charts or pictures are cut off at the top or bottom of the screen, adjust the width of the window to make it slightly narrower. This will force the items to resize so that they fit the page correctly. My other advice is to be sure you're using a relatively fast Wi-Fi set up. The PDF files for the books and materials are large, due to the length of some of the books and the many pictures that are included. This may require several minutes to download each file. I've been asked about providing zip files to download the materials. At this point I am still revising and finalizing each of the books. I'm uploading newer, revised files fairly frequently. After this process is completed, I will consider setting up the materials in zip files. If you do not see a menu at the top of the page, first try to make the window wider. If you make the window wide enough the menu will appear going across the top of the page. If you can't make the window wider, click on the words SOUND CITY READING on the left side of the green or black bar at the top of the page. The menu headings will appear along the bottom edge of the green or black bar. If you are on a smaller device and cannot make the window wider and you do not see the words SOUND CITY READING on the left side of the green bar at the top, you will see a down arrow symbol on the left side of the top bar that looks like a V. Click the arrow to see the menu. In this case, the menu will open in a separate window. Any menu item with a V beside it has submenu headings. Click on the V to see them. To view or download free PDF files for any of the Sound City Reading books or materials, click on PDF FILES on the menu at the top of the page. A drop down menu will show the categories for the various files. Click on the desired category to see the page with those files. Click on any of the green bars to download the files you want. The names for the books are shown on the bars. ​The Reading Street PDF files are under the READING STREET menu heading. The old soundcityreading.com web site is no longer online because its site building software was so old it had become unusable. You can find the updated, newest versions of most of the materials on this .net site. If you are looking for an older phonics book or any other item from the previous Sound City Reading web site and you can't find it, e-mail me at kathjdavis@gmail.com and I'll do my best to find it and post it in this new site. If you can tell me the title of the book you are looking for or the name of the PDF file that would be helpful. ​This site is still under construction!! I will be adding more materials as time permits. Some information is incomplete. Please continue to look for new updates. ​This is my second web site. I have added this site so that you can hear audio files and watch videos of instructional techniques, in addition to the PDF files for the books and other materials. The materials on this site are designed to be used in a sequential fashion, from the readiness level through second grade and up. Older readers may use the materials as a review or to provide thorough instruction in phonetic decoding and spelling to students who have not received it. The Sound City Reading materials are copyrighted, but I give permission to parents, teachers, and tutors to download, save, and print them for their own students or children. School wide use is permitted. All other uses are prohibited. This is a systematic, sequential phonics program. It starts by teaching the alphabet, followed by short vowel words. Students then learn words with basic phonics patterns, followed by words with advanced phonics patterns. Student are not expected to read text with phonics patterns that have not yet been taught. The program uses multi-sensory teaching techniques. Students see, hear, say, and write letters, letter patterns, and words. Phonemic awareness skills are taught. Students listen for letter sounds at the beginning and end of words. They learn to segment words (break them apart into separate sounds) and blend words (put the letter sounds together to pronounce the word). Alphabet letters and phonetic patterns are taught one at a time. Students say the sound for each new letter or letter pattern from sound charts and flashcards daily, so that they will be able to remember and apply the patterns. Students spell words by segmenting them. That is, they say the individual letter sounds, separately, as they write each letter or letter pattern in the word. Students do not spell phonetic words by saying the letter names. Students spell words with a new letter pattern before they read words with that pattern. As they spell new words, they listen carefully to the sounds and write them. Carefully analyzing words in this way prepares students to read the words more easily afterwards. After spelling a new set of words, read new words with the same phonetic pattern. There is a continuing emphasis on the meanings of new words. Sight words are taught as exceptions to the rules. For example, students learn the sight word "been" ﻿after﻿ they have studied words with the ee/feet pattern. After a series of new phonetic patterns has been taught, students read a short practice story that contains words with those patterns. With very few exceptions, the stories contain words with phonics patterns and sight words that have already been taught. As they continue to master new patterns, students will be able to read a few "easy reader" children's picture books during the second half of the phonics patterns level. At the advanced phonics patterns level, students will be able to read eighty-one popular children's picture books, with reading levels from first grade through the fourth grade. Recommended books are listed in the teaching materials when students are ready to read them. The books have been carefully screened and sequenced so that, with very few exceptions, students who have studied all of the phonics patterns taught, up to that point, will be able to decode all of the phonetic words in the book. Go to the menu heading OVERVIEW OF MATERIALS to see a sub-menu with information about each level in the Sound City Reading program. Click here to see a graph and a flowchart showing all of the Sound City Reading books and the order in which they are taught. My name is Kathy Davis. I have been teaching in one way or another since 1982. I started out as a nursery school teacher, and began working as a teaching assistant in the resource room at my children’s elementary school in 1985. It was there that I fell in love with teaching children who were having trouble learning to read. I went on to teach kindergarten, first grade, and second grade, ten years in Johnson City, Tennessee, and nine years in Cordova, Tennessee. Most of my years were in first grade. Along the way I tutored a number of children individually as well. I wrote the materials on this site to supplement the basal reading curriculum I used for teaching reading. I wanted all of my students to learn to read well, even those who were not sure of themselves at first. As the years went by, I revised the original materials and added more books, workbooks, and games. The materials and teaching methods on this web site have helped my students develop their reading skills for many years. They have worked so well I'm sharing them in the hopes that they will work with your students. I've given the name Sound City Reading to the phonics materials I've developed to help children learn to read and write. 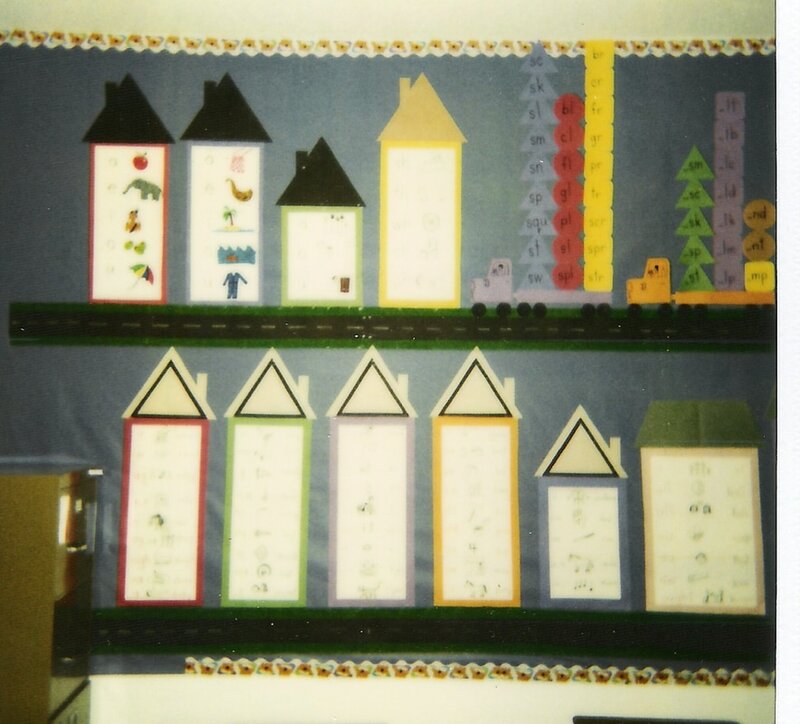 I've used this name because I added roofs to the first letter charts I put on my classroom wall to make them look like a row of houses in a city. These are pictures of the first "Sound City" sound charts. Unfortunately, they were taken with an instant print camera in 1992, and they have faded to the point that they are mostly illegible. The Sound City Reading materials are designed to help children learn the phonics patterns they need to become successful, independent readers. I hope that you will find them useful. ​The downloads for the materials are free, including written materials and videos. The written materials are in the form of PDF files that can be printed as practice books, workbooks, flashcards, and games.You may save the downloads on your computer or use them directly from the web site. You'll need Adobe Acrobat Reader DC to download the PDF files. It will take a few minutes to download each file. After the file downloads, it takes about another half minute to open. You may print the materials from this site and save any of the files to your computer after you open them. To make it easier to look through the pages of each PDF file, click on the button at the top of the page showing a box with four arrows pointing up, down, left, and right. This will give you a full view of each page. While I was a first grade teacher I used the Scott Foresman Reading Street program. I modified some of my previously developed materials so that they introduced phonics patterns in the same sequence taught in this reading series. There are phonics pattern worksheets, decoding sheets, stories, word wall materials, and tests. All of these materials can be reached by clicking the Reading Street tab on the menu bar at the top of this page.